Earlier this month, I noticed an advertisement on my local bank’s website. The advertisement said something like “FREE HIGH YIELD CHECKING – 2.01% APR!” Like most folks, I really don’t pay much attention to these advertisements on the interwebs because, you know, who has the time to worry about those things? So I paid no attention to the advertisement the first time I saw it or the second, third, or fourth times I saw it. In fact, I really didn’t pay the advertisement any mind until about a week and a half ago when I was sitting around thinking about the different financial institutions where I keep my various accounts and investments. Since this advertisement was telling me that I could get a high yield (i.e. earn a better-than-average interest rate) on money sitting in my checking account, I thought I should probably investigate what they were offering. After a few clicks on the Kearny Federal Savings website (I bank with Central Jersey Bank, which is now a division of Kearny Federal Savings) and I was reading information on the free high yield checking account option. 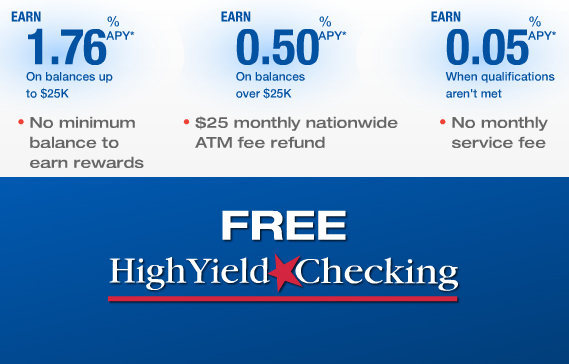 According to what I read on the web, it appeared that my usage patterns in my checking account qualified me to get one of these high yield accounts and I could earn myself a cool 2.01% APR. Here is the ad that was on my bank's site. Notice the rate has fallen to 1.76% from 2.01%. Like most people, I don’t like to mess with my day-to-day banking or investment accounts so I took some time to mull over whether I should bother with the high yield account or just leave well enough alone. Though it took me a few days, I finally decided to go over to my local branch of Central Jersey Bank and talk to them about the high yield checking account option. There’s no great “POW!” moment to end this portion of the entry, so be forewarned. I went over to the branch and the woman who assisted me was excellent and showed me how my usage qualified for the high yield checking account. We talked about the different checking account options and I opted to go with this account. So now my checking account is earning 1.76% (the rate went down a few days ago and will probably continue to go down each month – hey, I know it’s a promotion, but it’s a good one). While I was talking to the woman at the bank, I thought I might open up a savings account, too. I haven’t had a savings account at a brick-and-mortar bank in a long time – probably dating back to when I was in my first or second year of college (which, terrifyingly enough, was over a decade ago). For a long time now I’ve had a savings account at ING Direct and I’ve been very happy with its performance. Of course, the initial interest rate that I was receiving over at ING Direct was something like 4.50% and that’s dropped down to 0.90%, but I understand that the drop was more a function of a poor financial market than factors inside ING Direct (or any other bank for that matter). Anyway, I wanted to open up a savings account and two issues stopped me dead in my tracks. First, the interest rate that was being offered was 0.30%. Look, I understand that banks can’t pay even the 0.90% that ING Direct can pay because they need to invest and lend the money in savings and checking accounts and earn a nice spread to pay for their buildings and people, but 0.30% isn’t even competitive. Yet, I was still going to open up the account until the woman I was speaking with told me about the minimum balance requirement. I can’t remember what the minimum balance requirement was exactly, but it seems to me that it was a $1,000 balance at the end of each month or a $3 fee would be assessed. A $3 fee for not keeping at least $1,000 in a 0.30% savings account? Yeah right! Give me a break. Instead of dealing with that hot mess, I decided to just stick with my ING Direct account as my only savings account. I would liked to diversify and have a second savings account, but silly restrictions like the one noted above are not something that I have the time or the inclination to worry about. With respect to savings accounts, though, I’m thinking about looking into Ally Bank since they’re offering a similar rate to ING Direct (0.85%). This process did get me thinking, though. In particular, I started thinking more about the checking account that I use for Usable Web Solutions, LLC. I keep most of the funds for my small website business in Sovereign Bank, but I really haven’t been thrilled with their service since they were acquired by Santander a few years ago. Certain things have become a hassle that shouldn’t be a hassle. For example, they rebranded and changed their debit cards and so they sent me a new one to use. Like any new debit card, I had to activate it over the phone. The problem was that the phone activation system forced me (automatically for some reason) to an operator for final activation. Then this woman on the activation line may have asked me 50 questions to get this stupid card (which I didn’t want, request, or need) activated. It was like they missed the bigger picture of customer satisfaction and convenience. But convenience is something that Sovereign Bank has never really understood because they’re usually closed whenever I’m out of work and near a branch to make a deposit. This is an area where the old Commerce Bank really rewrote the rulebook in my opinion. By being open for longer hours each day, into the night, and on the weekends Commerce Bank provided the type of customer service that the New Jersey banking market really hadn’t seen before. And it was great! And then TD Bank came in and crapped all over Commerce Bank’s customer-friendly reputation, but that’s another story. In any event, this entire process has me thinking about some of my other banking and investment accounts. I’ve scheduled a meeting with my company’s 401k agent to talk to her about my asset allocation in my 401k account. For some reason, I’ve got a gut feeling that now is the time to invest heavily in aggressive, struggling funds. Yeah, they’re probably going to go down again, but I think they’re going to come roaring back in the next 2 – 3 years. I guess we’ll see, but I want to meet with the agent to be sure that my feeling is reflected adequately in my asset allocation. Ahhh... the good old days! Further, I’ve been thinking about my credit card. For the last four or five years I’ve used a Worldpoints MasterCard that is branded with my fraternity. For the longest time I thought that each time I made a purchase, my fraternity received a small kickback. Last year I found out that my perception of this program was incorrect and the fraternity simply received an annual fee from the credit card company for the co-branding arrangement. So the affinity that I had towards this credit card is gone even though I’ve used the Worldpoints option to receive a few checks (each for a few hundred bucks) because I frequently use my credit card (and pay it off immediately – I haven’t paid one penny of interest in years on the card). Since the only thing keeping me hanging on to this credit card is the Worldpoints feature, I’ve been researching other “cash back” credit cards and all of the reviews point me towards the Freedom Chase card. Sure, the interest rate is a bit high and variable (both unacceptable for someone who isn’t a credit risk at all), but I don’t carry a balance anyway so I wouldn’t be paying the interest. Plus, there are a variety of ways to double, triple, quadruple, and quintuple (that’s “multiply times five,” folks) the amount of points that you get for certain purchases with the Freedom Chase card. So I’ve been thinking about possibly getting that card. And I’ve also been looking into the Barnes & Noble MasterCard because, you know, I’m a Barnes & Noble fan. They’re big draw is that for everyone 2,500 points you earn (i.e. every $2,500 you spend on the credit card), you get a free $25 Barnes & Noble gift card sent to you. You also get 5% off everything at their store. There are some months where I spend more than $2,500 on my credit card, so getting that monthly gift card would be nice. But then again, it would also be nice to build a whole bunch of points with Freedom Chase and get cash back instead of a gift card. Nothing wrong with one of these big, massive banks sending me a check every once in a while, you know? Anyway, what about the rest of you? Is anyone else out there reassessing where they put their money and which financial products they use during this cloudy economic climate? One year ago today I went to TD Bank and asked them to close my account after being a good, loyal customer for ten years (first of Commerce Bank and then of TD Bank). As you might recall, this good, loyal customer was treated horribly by TD Bank by being lied to over a petty $15 fee. Well, I hope their fee was worth losing a customer over because for the last 15 months I’ve been a very happy, very pleased customer of Central Jersey Bank. If you're in Central Jersey - use this bank! Some folks thought that moving to a local, community bank was a bad idea since they invariably get bought up by larger banks. I disagreed with that point of view then and I disagree now. And yes, in the last 15 months since I joined Central Jersey Bank they were, in fact, acquired by a larger bank (Kearny Federal Savings Bank), but I’m not bothered by the acquisition at all. I haven’t been negatively impacted by this purchase other than that I now have more locations where I can use my debit card and not be charged a fee, which is actually a great benefit. There hasn’t even been a substantial name change yet other than renaming the bank “Central Jersey Bank, a division of Keary Federal Savings Bank.” I’m sure at some point there will be a larger name change, but – really – who cares? Anyway, I just thought that I’d take a moment to recommend that each of you explore your local community banks and credit unions as a place to deposit your funds. You’ll find that when you’re a real name and a real face to the people at the bank, they’ll treat you better than the big banks who are mostly concerned about earning fees off your back. Finally Done With TD Bank – Thank God! America’s Most Miserable Bank (a.k.a. TD Bank) officially has one less customer as of this morning. As I’ve chronicled on this blog a few times, I’ve been transitioning my direct deposits and direct debits out of TD Bank ever since they bungled the merger of TD Banknorth and TD Bank’s online systems back at the end of September. In reality, I probably finished transitioning to Central Jersey Bank at some point in November, but I decided to keep the TD Bank account – just in case I needed it for something. Apparently, I was too idealistic. The fact is that TD Bank has absolutely destroyed whatever good will existed between the company and its old Commerce Bank customers. In fact, while looking through my online account, I found the following message that I sent back in October…which has still gone unanswered. When will my account be updated via the online interface again? I have not been able to see my real-time account information for a few days and that is unacceptable. I need to know what my balance is and whether or not my direct deposit for my paycheck hit my account yesterday. I have automatic debits coming out of this checking account today and tomorrow that absolutely must be honored. I’ve tried calling the customer service lines and they’ve been disconnected, which is unacceptable. At this point, I am exploring checking account offers at other banks. This is not the level of customer service that Commerce Bank was built on and that I grew to enjoy from that bank. If this is how TD is going to run its operations, then I don’t see myself being a customer of this bank for too much longer. In the year 2009 and almost 2010, this is completely unacceptable. TD Bank ought to be ashamed of itself. Well, TD Bank certainly wasn’t ashamed of itself for that blunder. In fact, they began treating their clients worse and worse, which brings me to my latest (and final) online interaction with this horrible, customer unfriendly bank. These guys changed the type of account that I had (without my consent) and began charging me whenever my account dipped below $100. Take a read of the message that I sent to TD Bank a few days ago. Why am I constantly charged a $15 fee when my account goes below $100? That is absolutely unacceptable. I have accounts with a local bank, Bank of America, and Sovereign Bank in addition to TD Bank and yet TD Bank is the only one that charges this absolutely unacceptable fee. Please refund this fee immediately. I am at the point where TD Bank’s consistent unacceptable treatment of its customers is making me want to close this account. I thought that was a pretty tough statement – straight and to the point. I figured that TD Bank would respond by saying something that was customer friendly. Instead, I received this message. On September 25, 2009, your account was changed to the Convenience Checking, which has a $100.00 minimum balance requirement to avoid a $15.00 fee. Unfortunately, we will no longer be offering a free account. However, we do have other options that may better suit your banking needs. Our Value Checking does not have a minimum balance requirement. This account has an automatic $3.00 monthly fee and allows 8 checks written per statement cycle. Each check written over 8 per statement has a $0.50 charge. This information was mailed in August and outlined what your account type would be changed to. We encourage you to review other products that we currently offer, as you may find that we offer an account more suitable to your needs. This fee is not an error and cannot be reversed. If you have any further questions, please contact us via email or call 1-888-751-9000 to speak with a Customer Service Representative, 24 hours a day, 7 days a week. Seriously… that’s what they sent me. They sent that to me – a guy who has been a customer of this bank for about a decade, a guy who has never EVER bounced a check, a guy who consistently has well above $1,500 in his checking account. Why was my account below $100? Because I was transitioning my direct debits and direct deposits out to Central Jersey Bank – and I’m glad that I did! I’ve had enough of the shameless nickel and diming that goes on at TD Bank. When you combine this nickel and diming with the bank’s absolutely pathetic approach towards customer service, how can anyone remain a customer of this institution? I responded to the message above with the one below. I’ll be closing this account on Saturday. TD Bank has ruined Commerce Bank’s reputation in New Jersey. And that’s that. I closed my account earlier today and I am so glad that I did. TD Bank got their $15 as I saw my way out of being a customer. I hope those measly $15 were worth losing an outstanding customer (who happens to have an online vehicle to write the type of annoyed, fed-up article that you’re reading right now…which will be online in perpetuity). Enjoy the $15, TD Bank…because I’m going to enjoy bashing your pathetic company for the rest of its sorry existence. For those of you who are looking for even more commentary presented from a unique New Jersey point of view, be sure to follow JerseySmarts.com on Twitter @JVince81. Also, sign-up for our quarterly newsletter by using the sign-up form in the box to the left. The newsletter is sent four times each year to provide links to just a few of the top stories that you might have missed. That’s it – there’s no random sales pitch and we do not sell our mailing list to any third party advertising companies. The only updates you will ever receive are from JerseySmarts.com with links to the latest updates from this site. That’s it. Period. Why Are Banks So Frustrating? Like everyone else who has ever dealt with a bank, I can sometimes become very frustrated at the stuff that the bank puts you through. The biggest example, which there is no need to rehash here, is the entire TD Bank debacle that is losing that bank thousands of customers (myself included). In order to free myself from the cold, faceless, nameless bank that bought up Commerce Bank, I’ve decided to switch to a local, community bank in my area called Central Jersey Bank. But my aggravation this morning comes from the Bank of America. You see, once upon a time I opened up a credit card account with a group whose name I can’t remember now. Then that group was purchased by a company called MBNA. Then MBNA was purchased by the Bank of America. And thus I have a credit card with the Bank of America. In general, I don’t have many complaints about the Bank of America, but I think in their attempt to do the right thing, they’ve managed to bring me some added aggravation. Apparently, some Bank of America credit card numbers were compromised the other day and the bank did the right thing by immediately eliminating those account numbers and issuing new ones. However, they didn’t send the new credit cards out until yesterday. Why the delay? Yes, I understand that these cards needed to be printed and shipped (and, hopefully, checked for accuracy along the way). Yet, this delay in sending the new credit cards has left me here on Tuesday morning with a credit card that doesn’t work (the old one with the old number). This wouldn’t be a problem except for the fact that I intend to use my credit card this Friday night. And since my official mailing address is in North Jersey while I live in Central Jersey, I am now faced with the problem of getting this credit card into my little hands before Friday night when I have a packed schedule for the rest of the week. So – like I said earlier – Bank of America did the right thing by having a new credit card issued, but dropped the ball by not sending the replacement card much earlier than yesterday. That’s okay, though. It’s good to know that at least one bank out there is trying to do the right thing by its customers. Like I said at the end of last week, TD Bank has ruined everything that Commerce Bank built its great reputation on. From Commerce Bank’s legendary customer service to its “hassle-free” banking, TD Bank managed to destroy all of that in a matter of few days last week by bungling up what could have been a less onerous project. If you don’t know already, TD Bank merged the TD Banknorth and Commerce Bank databases last week and it stunted the bank’s ability to post transactions to customers’ online accounts or for those transactions to be viewed at ATMs. Factor in that the folks at TD Bank decided to do this during a time of the month when almost every once of their customers gets paid or receives their government subsidy and, well, you can understand the uproar. Some TD Bank supporters out there might suggest that technical glitches happen every once in a while and I can appreciate that statement. However, when a bank decides to make such a major switch during a time of the month when people are receiving paychecks and governments subsidies (plus when rent or the mortgage payment is due), that tells me that the bank doesn’t care enough to know about their customers’ daily lives. Something tells me that the move from Cherry Hill to Toronto really destroyed the true relationship that TD Bank had with its customers. Anyway, I went over to Central Jersey Bank on Friday and opened up a totally free checking account. Central Jersey Bank (although it was just purchased by OceanFirst Bank) is based out of the Monmouth/Ocean county area. Because this bank is based out of the same area where I live, there is a greater likelihood that I’ll be more than just an account number and a deposit at Central Jersey Bank. In fact, after reviewing the offers from Central Jersey Bank, I’ve decided to explore other accounts that I can close at TD Bank (including those related to my fraternity and its alumni association) and move over to Central Jersey Bank. I’m a big believer that when you go to a restaurant and you receive stellar service, that you leave a stellar tip. On the other hand, I also believe that when you are the customer and you receive horrendous service you vote with your dollars by pulling them from the company giving you the terrible service. TD Bank really screwed up. Between the bungled online transactions, their recent message to all business account owners that they were raising fees, and the continuing fee that I have to pay if my account ever dips below a certain amount (this is for a supposedly “free” checking account, by the way) – I’ve decided to vote with my dollars and leave TD Bank. I suggest that any former Commerce Bank customers who are disgusted at the level of service offered by TD Bank do the same.